Experimental artist and researcher Michael Esposito will present some experiments and sound art from his recent work with Electronic Voice Phenomena. Michael recently completed an album in collaboration with Brent Gutzeit constructed from EVP recordings gathered at dorkbot Chicago’s host, Enemy. 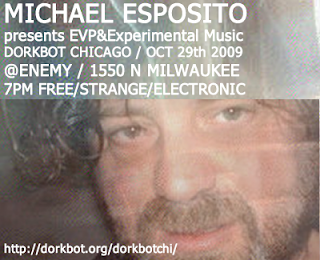 Michael Esposito is an experimental artist and researcher in Electronic Voice Phenomena (EVP). Over the years, under the Phantom Airwaves institution, Michael has participated in hundreds of paranormal investigations all over the world. He has conducted extensive research at many active locations and has developed a great deal of unique theory and devised many unique experiments within the field of EVP. Working extensively with EVP’s relationship to experimental music, Michael combines EVP with field recording and related frequency tones of research sites to provide an audio-archeological picture of both sides of the veil. Michael is currently published by Touch Music[MCPS] UK. What is a “dorkbot”?! The idea of the international dorkbot network is “people doing strange things with electricity” and meeting in informal, friendly environments to discuss their projects. These projects could include hardware hacks, New Media Art projects, creative code, circuit bent musical instruments or wild DIY garage science!